Draft: 2004, Anaheim Angels, 1st rd. Jered David Weaver…he and his wife, Kristin, have one son, Aden (in honor of late former teammate Nick Adenhart), and one daughter, Josie…attended California State University Long Beach where he was inducted into the LBSU Athletics Hall of Fame on November 9, 2011...owned a career 37-9 record and 2.43 ERA in three seasons with LBSU …earned eight 2004 National Player of the Year Awards...graduated from Simi Valley High School where he earned All-CIF, All-League and first-team All-LA...younger brother of former Major League pitcher Jeff Weaver…spent one season (2006) as teammates in Anaheim...originally signed by Angels Scout Bobby DeJardin. Pitched to a 12-12 record in 31 appearances, all starts, with Los Angeles (AL) and posted a 5.06 ERA (100 ER, 178.0 IP), 103 strikeouts against 51 walks and a .297 opponent batting average...Over his first four starts of the season from 4/10 - 26, went 3-0 with a 3.86 ERA (10 ER, 23.1 IP), 11 strikeouts against seven walks and .286 opponent batting average ...Over his final seven starts from 8/25 - 9/26, went 4-1 with a 3.63 ERA (16 ER, 39.2 IP), 34 strikeouts against 14 walks and a .233 opponent batting average...Over his other 20 starts from 5/12 - 8/19, went 5-11 with a 5.79 ERA (74 ER, 115.0 IP), 58 strikeouts against 30 walks and .320 opponent batting average...Earned his 150th career Major League win on 9/21 at Texas...Tossed his eighth career shutout and 14th career complete game on 6/19 at OAK...Recorded his 1,500th career strikeout on 4/16 at MIN...Went 6-2 with a 3.94 ERA (27 ER, 61.2 IP) in day games as opposed to a 6-10 record with a 5.65 ERA (73 ER, 116.1 IP) in night games. Went 7-12 with a 4.64 ERA (159 IP - 82 ER) in 26 starts for Angels. Recorded final victory of the season September 11 vs. Houston and tied Nolan Ryan for second place on the Angels all-time wins list. Made 289th career start September 21 at Houston and surpassed Nolan Ryan for second place on Angels all-time starts list. On August 19, became fifth pitcher since 1990 to toss at least 1,800 innings while pitching exclusively with one franchise (joining Felix Hernandez, Justin Verlander, Matt Cain and Brad Radke). Walked one-or-fewer batters in 16 of his 26 starts this season… His 11 starts with no walks in 2015 were second most in the American League (Michael Pineda - 12)… Had career-best streak of 94 consecutive batters faced without a walk from April 11 - May 3 (STATS LLC). Tossed a shutout May 8 vs. Houston… Marked seventh career shutout and 13th career complete game. Opened the season with an 0-4 record and 6.29 ERA (34.1 IP - 24 ER) through his first six starts... Went 4-0 with a 1.98 ERA (36.1 IP - 8 ER) in his next five starts from May 8-30. Missed 40 games on the disabled list from June 21 - August 9 with left hip inflammation... Marked fourth DL stint of career. Pitched in two games on a rehabilitation assignment with Class A Advanced Inland Empire and did not factor in a decision while pitching to a 1.93 ERA (9.1 IP - 2 ER)… Recorded seven strikeouts while walking four. On April 6 at Seattle, made seventh career Opening Day start and sixth in a row for the Angels… Both are franchise records… Only other pitcher in club history to make at least five Opening Day starts is Mike Witt , who took the hill on Opening Day for the Halos each year from 1985-89... Only CC Sabathia (9) and Felix Hernandez (8) have made more Opening Day starts since 2006. Posted an 18-9 record and 3.59 ERA (213.1 IP - 85 ER) in 34 starts for Angels...Among American League leaders, ranked tied for first with 18 wins, tied for first with 34 starts, ninth with 213.1 innings pitched, and tied for ninth with a .667 winning percentage...Joined Lefty Grove (1925-33) as only A.L. pitchers with 10+ wins and 100+ strikeouts in each of first nine big league seasons...Is one of 17 pitchers in American League history to record 1400+ strikeouts within his first nine big league seasons...The list includes Hall-of-Famers Bert Blyleven, Jim Bunning, Bob Feller, Lefty Grove, Walter Johnson and Ed Walsh...Joined Nolan Ryan as only players with three 18+ win seasons as an Angel (Ryan reached the mark four times: 1972, 1973, 1974 & 1977)...Became one of three pitchers all-time to record 130+ wins and 1400+ strikeouts with fewer than 70 losses in his first nine big league seasons, joining Roy Oswalt and Dwight Gooden...Reached 100 strikeout mark in start July 18 vs. Seattle, becoming second pitcher in Angels history with nine straight seasons of at least 100 strikeouts recorded...Chuck Finley holds Club record with 12 straight 100+ strikeout seasons (1988-99)...Angels won each of his seven starts from June 21 - July 23...Pitched to a 4-0 record and 2.68 ERA (43.2 IP - 13 ER) in that span...In six July starts, went 3-0 with a 4.54 ERA (33.2 IP - 17 ER) and 28 strikeouts...Angels have won 22 of Weaver's 24 career home starts in the month of July...He owns a 17-1 home record in that span...Registered complete game victory May 21 vs. Houston, allowing one run on two hits...Marked first complete game since Aug. 6, 2012 and 12th of career...Surpassed Mike Witt for sole possession of third place on Angels all-time strikeouts list May 21...On Aug. 11, Weaver and wife Kristin welcomed their second child and first daughter to the family...Josie was born 7 lbs, 14 oz and 19 1/2 inches long. Finished season at 11-8 with a 3.27 ERA (154.1 IP - 56 ER) in 24 starts, allowing 139 hits (17 HR) while walking 37 batters and striking out 117…Eighth straight season with at least 10 victories... Joined Nolan Ryan as the only Angels to win at least 10 games in eight consecutive seasons...Ryan and Chuck Finley are the only other Angels to record at least 10 wins in eight separate seasons... The 11 victories bring his career win total to 113 and claim third place on the Angels' all-time list, trailing only Chuck Finley (165) and Nolan Ryan (138)... One of four active Major Leaguers who have pitched their whole careers for one team and have tallied at least 100 wins, along with Detroit's Justin Verlander (137), Seattle's Felix Hernandez (110) and Boston's Jon Lester (100)... Recorded 117 strikeouts to move into sole possession of fourth place on the Angels' all-time strikeout list with 1,236 for his career…He now trails only Nolan Ryan (2,416), Chuck Finley (2,151) and Mike Witt (1,283) on the franchise's all-time list... Became third pitcher in AL history to have a winning record and at least 10 wins in each of his first eight seasons joining Addie Joss (1902-09) and Andy Pettitte (1995-2002)... Missed 45 team games on the disabled list from April 9th through May 29th with a non-displaced fracture to the left-side radial head (non-surgical) on his left arm…Suffered the injury on April 7 at Texas attempting to avoid a Mitch Moreland liner…Marked third DL stint of career... Streak of five straight seasons with at least 30 starts was snapped...His 24 starts are his fewest since making 19 during his rookie campaign in 2006 and his 11 wins are tied for fewest in a season in his career (also won 11 games in 2006 and 2008)... Made six interleague starts this season and went 3-1 with a 1.95 ERA (37 IP - 8 ER)…Three of his first four starts in 2013 came against National League opponents…Owns the best career ERA in interleague history (min. 125 innings pitched) at 2.45 (161.1 IP - 44 ER).Since 1992, Weaver's 59 wins at Angel Stadium are the most by any big league pitcher…Among actives, ranks second in the AL in career victories in his current home park (Verlander - 72 wins at Comerica Park)…Allowed just 12 earned runs in last 56 innings pitched at the Big A (1.93 ERA)... In nine starts from June 27-August 9, went 6-1 with a 1.72 ERA (62.2 IP - 12 ER) and 52 strikeouts... On July 5, Weaver and wife Kristin welcomed the birth of their first child, son Aden David Weaver…The spelling of the name is in honor of the late Nick Adenhart. Finished season 20-5 with three complete games, two shutouts and a 2.81 ERA (188.2 IP - 59 ER) in 30 starts...Allowed 147 hits (20 HR) while walking 45 batters and striking out 142...His 20 victories set a career high and tied for tops in AL...Just seventh Angel to reach 20-win plateau...Halos went 23-7 in his 30 starts...Logged 21 quality starts and pitched at least six innings in 24 of his 30 outings...Honored with Nick Adenhart Award for fourth consecutive season as Angels' top pitcher (as voted by teammates)...Among AL leaders, finished first in winning percentage (.800), opponents batting average (.214), WHIP (1.018) and hits per nine innings (7.0), tied for first in wins and third in ERA...800 winning pct. established a single-season club record...Tossed first career no-hitter, May 2 vs. Minnesota (10th overall no-hitter in club history)...Sixth Angels' no-hitter thrown at Angel Stadium, the first since a combined no-hitter by Mark Langston and Mike Witt, April 11, 1990 vs. Seattle...First individual no-hitter at Angel Stadium since Nolan Ryan June 1, 1975 vs. Baltimore...Final pitching line: 9 IP, 0 H, 1 BB, 9 SO, 121 pitches, 77 strikes...Put together string of nine straight wins in as many starts, June 20 - Aug. 6, coming one win shy of franchise-best mark set by Chuck Finley when he won 10 straight starts in 1997 (7/1-8/15)...Weaver won 10 decisions over 12 starts, longest win streak in AL in 2012...Recorded 1,000th career strikeout, April 16 vs. Oakland, becoming just eighth Angel to reach mark with the club...Joined sibling Jeff as sixth brother tandem in MLB history to reach 1,000 strikeouts...Earned 100th career victory, Sept. 18 vs. Texas, becoming sixth pitcher in franchise history to record 100-plus wins with the club...Finished first half at 10-1 with a 1.96 ERA, first pitcher since Sandy Koufax (1963-64) to tally 10+ first-half wins and a sub 2.00 ERA in consecutive seasons (11-4, 1.86 in 2011 at ASB)...Earned third straight All-Star selection, becoming first Halo to get nod three straight seasons since Vladimir Guerrero (2005-07)...Went 6-0 in July, just eighth AL pitcher since 1921 to go 6-0 or better in July...First Angel to win six-plus games in calendar month since Finley won seven in July of 1997...Missed 19 games (May 29-June 20) on disabled list with a lower back strain and spasms, just second DL stint of his career and first since start of 2007 season. Finished 2011 season 18-8 with a 2.41 ERA (235.2 IP - 63 ER)in 33 starts with Angels...His 18 wins and 235.2 IP representcareer-bests while he finished two strikeouts shy of secondconsecutive 200+ strikeout season...Among A.L. leaders, finishedsecond in ERA, third in wins, tied for fourth in complete gamesand eighth in strikeouts...Signed five-year contract extension,July 19, keeping him in an Angels uniform until 2016...Threw 7+IP and allowed one ER or less in an MLB best 17 starts...Struckout a career-high 15 batters, April 10 vs. Toronto, becomingfirst Angel pitcher to record 15 strikeouts in a game since ChuckFinley (May 23, 1995 vs. NYY) and first Halo right-hander tonotch 15 K's since Mike Witt in 1984 (16 K's, July 23, 1984 vs.SEA)...Marked 18th time in club history an Angel pitcher hasreached 15 punch outs (non extra-inning game) and the sixthAngel pitcher to achieve feat...With fourth victory, April 15 at Chicago, set an MLB record for the earliest calendardate on which a starting pitcher has won his fourth game...The last starting pitcher to register four wins in histeam's first 13 games was Roger Clemens with Boston in 1991...Became just the fourth pitcher (fifth occurrence) inML history to go 6-0 in March/April...Tossed fifth career complete game, April 25 vs. Oakland, his second completegame in as many starts...Became first Angel to throw a complete game in back-to-back starts since John Lackey in2006...Set a new club record in 2011 tossing 15 straight quality starts...Also became first pitcher in club history tonotch six victories in club's first 23 games...Last ML pitcher to accomplish feat was Randy Johnson in 2002...Joinedteammate Dan Haren as the first two pitchers to post a sub-1.00 ERA through their team's first 12 games sinceMaddux and Glavine in 1998...Became first pitcher since Pedro Martinez in 2000 (13-4, 1.46) to notch 12-or-morevictories with a sub-2.00 ERA after his first 20 starts...Joined Frank Tanana as the only two Halos in club historyto notch 10 wins with a sub-2.00 ERA on or before July 2...Named to second consecutive All-Star Team, becomingthe first Angels starting pitcher named to consecutive All-Star teams since Chuck Finley in 1995 & 1996...Madestart for A.L. squad, becoming just the fifth Angels hurler to start the mid-summer classic (Chance, McBride, Ryan,Langston)...His 1.86 ERA at the All-Star break was the lowest such mark in club history (minimum 19 starts)...Had club-record streak of 15 consecutive quality starts end August 13 at Toronto, when he matched his career-high(third time) allowing eight runs...Had allowed eight earned runs over previous seven starts combined...Threw 6+IP while allowing seven hits-or-less in 25 straight starts (10/1/10 - 8/5/11), the longest such streak in MLB since1919...Served six-game suspension, August 6-12, handed down by MLB for actions in July 31 game at Detroit. Completed fifth season with Angels, earning second consecutive NickAdenhart Award for Pitcher of the Year after going 13-12 with a 3.01ERA (224.1 IP - 75 ER) in 34 starts...Allowed 187 hits (23 HR) whilewalking 54 batters and striking out 233...Set career-highs and led clubin starts, innings pitched and strikeouts while earning first career All-Star selection...Finished season as the Major League strikeout leader,becoming the first Angel to accomplish the feat since Nolan Ryan in1977 (341)...His 233 strikeouts rank 10th in Angels' single-seasonhistory - most since Nolan Ryan's 260 strikeouts in 1978...Surpassingthe 200 strikeout mark for first time in career, Weaver joined teammateErvin Santana (2008) as only Angels to record 200-or-more strikeoutssince 2000...Among league leaders, placed first in strikeouts, fifth in ERA, fourth in innings pitched, sixth in averageagainst (.222), and first in home ERA...His 1.86 home ERA is the third lowest mark in Angels' history (min. 10starts)...With 10th victory on August 1st, became the first Angel in club history to begin career with 10-or-more winsin each of first five seasons...With victory on August 6 notched 30th career road victory, becoming only the secondpitcher in Angels history to win at least 30 of his first 50 road decisions (J. Washburn, 33-17)...With 11 strikeoutson August 29, notched fifth start of 2010 with 11-or-more strikeouts, becoming the first Angels hurler to do so sinceNolan Ryan did it five times in 1979...Allowed three earned runs-or-less in 27 of 34 starts...Tossed six innings-or-morein 24 of final 25 starts...Posted a 2.32 ERA (50.1 IP - 13 ER) over his final seven starts. Completed fourth season with Angels and put together a career-year...Voted as honoree of inaugural Nick Adenhart Award forteam Pitcher of the Year...Was 16-8 with four complete games, two shutouts and a 3.75 ERA (211 IP - 88 ER) in 33 starts...Setcareer bests leading Halos in wins, starts, innings pitched, complete games and strikeouts (174)...Among AL leaders, rankedT3rd in CG's (4), tied for 7th in wins, 9th in ERA, 10th in innings pitched and 10th in strikeouts...Earned victory in first start,April 10 vs. Red Sox, club's first game following tragic death of Nick Adenhart (6-3 win; 6.2 IP, 4 H, 1 R, 0 ER, 2 BB, 8 SO)...Recorded first career complete game, May 7 vs. Blue Jays (6-1 win; 9 IP, 3 H, 1 R, 1 ER, 8 SO)...Tossed another complete game10 days later at Rangers, May 17 (3-0 loss; 8 IP, 6 H, 3 R, 3 ER, 3 BB, 7 SO)...Recorded first career shutout vs. Padres, June 14(6-0 win; 9 IP, 5 H, 1 BB, 5 SO)...Shutout capped four-game win streak in which he posted a 1.20 ERA (30 IP - 4 ER)...Facedbrother Jeff Weaver (Dodgers), June 20th, becoming eighth brother-tandem in ML history (21st overall occurrence) to face offas starting pitchers and first since Alan and Andy Benes in 2002...Entered All-Star break with 10-3 record...Recorded careerhigh11 strikeouts in two-straight starts, August 2 at Twins and August 8 vs. Rangers...Became first Angels pitcher with 10 ormore strikeouts in consecutive starts since John Lackey had 10 strikeouts in three consecutive starts in 2006 (July 2-14)...Posted fourth career complete game at Cleveland, August 19 (9 IP, 7 H, 1 BB, 2 SO)...Went 9-3 record at home with a 2.90 ERA(115 IP - 37 ER) compared to 7-5 with a 4.78 ERA (96 IP - 51 ER) on the road...His 2.90 ERA at Angel Stadium was 5th besthome ERA in AL...Had six consecutive scoreless inning streaks of nine or more, with a high of 11, twice. Completed third season with Angels...Was 11-10 with a 4.33 ERA (176.2 IP - 85 ER) in career-high 30 starts...Logged career-best 152 strikeouts and 176.2 IP...Scratched from Sept. 5 start at Chicago and Sept. 9 vs. New York due to laceration of finger tips on middle and ring fingers of right hand...Injury occurred when fingers were cut by staples on underside of dugout bench at Comerica Park in Detroit...Dropped 1-0 decision vs. Los Angeles, June 28 at Dodger Stadium, combining with Jose Arredondo on eight inning (unofficial) no-hitter...Lone unearned run scored in fifth inning on two errors (Weaver & Jeff Mathis) and a sacrifice fly...Marked fifth time (second combined) in modern era of Major League Baseball that a team (first vs. Angels) has won without benefit of a hit and first since April 12, 1992 (first game of a doubleheader) - Indians beat Boston, 2-1, in Cleveland despite getting no-hit for 8.0 innings by Matt Young...Marked ninth time (second combined) Angels have held team hitless in a game and first since Mark Langston-Mike Witt, April 11, 1990 vs. Seattle (1-0 win)...Equaled career-best 8 IP (three times), June 10, 2008 vs. Tampa Bay (6-1 win) and May 24, 2008 at Chicago (2-0 win)...Also pitched 8 innings, Aug. 29, 2007 at Seattle...Has yet to lose three straight starts in career...Made first career Opening Day start, March 31, 2008 at Minnesota (3-2 loss; 6.1 IP, 8 H, 3 R, 3 ER, 2 BB, 5 SO)... Allowed fourth career first inning leadoff home run, April 22, 2008 at Boston (Jacoby Ellsbury)...Allowed fifth leadoff HR, July 22 vs. Cleveland (Grady Sizemore)...Was 5-0 with a 1.37 ERA (26.1 IP, 18 H, 4 R, 4 ER, 2 HR, 3 BB, 19 SO) in six Spring Training starts in 2008. Completed second season with Angels, registering 13-7 record and 3.91 ERA (161 IP - 70 ER) in28 starts...Began season 15-day disabled list and was placed on DL March 31 (retroactive to March 23),due to recovery from biceps tendinitis...Recalled from rehab and activated from DL, April 17...Was 1-0with a 0.82 ERA (11 IP - 1 ER) in two rehabilitation starts with single-A Rancho Cucamonga...Did not pitchin game with Angels this Spring Training...13 wins surpasses total from 2006 (11)...Pitched eight innings,Aug. 29 at Seattle, marking longest outing of career (8-2 win)...Won five straight decisions (seven starts),May 14-June 16...Posted 3.49 ERA (38.6 IP - 15 ER) during streak...Did not strike out a batter, June 10 atSt. Louis, for lone time in a start in career (42 starts)...Career ERA reached above 3.00 for first time (3.04)in brief tenure after 28 starts...Last pitcher to keep ERA below 3.00 in first 27 appearances of career asstarter only was Aaron Sele of Boston in 1993-94 (ERA topped 3.00 in 29th start - 3.09)...Limited opponentsto three earned runs-or-less in 21 of 28 starts...Pitched into seventh inning-or-later eight times (5-1record)...Allowed 17 home runs in 161 innings pitched (0.95 per 9 IP)...Strikeout high was nine, May 3 atKansas City (6 IP)...Was 3-1 with a 3.82 ERA in May and 2-1 with a 2.01 ERA in June...Allowed first careergrand slam, Aug. 18 at Boston (David Ortiz)...Walked 45 batters (3 IBB) and struck out 115 (1.60 BB & 4.11SO per start)...Angels were 16-12 in his starts. In 2006, began second professional season at triple-A Salt Lake...Finished season with 6-1 record, two complete game shutoutsand a 1.99 ERA (77 IP - 17 ER) in 12 games (11 starts)...Allowed 63 hits (7 HRs), walked 10 and struck out 93 batters...NamedOrganization Pitcher of the Month for May, posting 2-0 record and 0.32 ERA (28 IP - 1 ER) in four starts...Struck out 10-or-morebatters three times, including professional best 14, June 23 vs. Sacramento...Posted consecutive scoreless innings streak of27.1, May 6-22, tying franchise record set by Kevin Gregg (now held by Joe Saunders)...Lone relief appearance came April 29 atTacoma (first of career)...Had contract purchased by Angels, May 26...Was recalled by Angels from triple-A Salt Lake, June 30...Was 11-2 with a 2.56 ERA (123 IP - 35 ER) in 19 starts withAngels overall...Among AL rookie leaders, ranked third in ERA, third in wins, tied for fourth in starts, fourth in innings pitched,third in strikeouts and third in average against (.209)...Opened major league career with 9-0 record, tying AL rookie record asstarting pitcher to open career (Whitey Ford of Yankees in 1950)...Marked only third pitcher in last 100 years to go undefeatedin first 12 starts in majors while winning at least nine of those games; Ford (1950) and Livan Hernandez (1997) were both 9-0at that juncture of their careers...No pitcher has posted better mark in first 12 big-league starts since Hooks Wiltse, who woneach of his first 12 for the 1904 Giants...Previous pitcher to win first nine career decisions as starter was Livan Hernandez ofFlorida in 1997...Only four other pitchers in MLB history began career 9-0 as starter: Hernandez with Florida in 1997 (9-0), KirkRueter with Montreal in 1993-94 (10-0), Ford with Yankees in 1950 (9-0) and Wiltse with NY Giants in 1904 (12-0)...Nine-gamewin streak equaled longest in major leagues this season (four other players)...Won first seven major league starts, becomingfirst Angel to do so in club history (Bo Belinsky - 5, April 18-May 11, 1962)...Was first pitcher in major leagues to win firstseven starts of career since Fernando Valenzuela of the Dodgers in 1981 (first eight starts) and first in AL since adoption ofdesignated hitter in 1973 (Baltimore's Ben McDonald won first five starts in 1990)...Defeated Erik Bedard and Baltimore, 10-1,May 27 at Angel Stadium...Start marked major league debut and first ML win...Limited Orioles to three hits in seven inningspitched...Just one baserunner reached third base...Threw 97 pitches, 64 strikes...Including final three-plus starts with triple-ASalt Lake, posted 40.1 consecutive scoreless innings pitched, May 6-June 2...Missed scheduled start, July 17 vs. Cleveland, dueto tendinitis right biceps...Allowed career-high four home runs, August 29 at Seattle. In 2005, was 3-3 with a 3.98 ERA (43 IP - 19 ER) in eight starts at double-A Arkansas and 4-1 with a 3.82 ERA (33 IP - 14ER) in seven starts at single-A Rancho Cucamonga in 2005...Named California League Pitcher of the Month for July (4-0,1.52 ERA) and Pitcher of the Week honors for July 11-17 & July 18-24...Played for Scottsdale Scorpions in Arizona FallLeague (1-3, 5.47 ERA, 7 GS)...Selected by Angels in first-round (12th pick overall) of 2004 Free Agent Amateur Draft...Signed with Angels, May 30, 2005. August 16, 2017 RHP Jered Weaver retired. August 4, 2017 San Diego Padres transferred RHP Jered Weaver from the 10-day disabled list to the 60-day disabled list. Left hip inflamation. 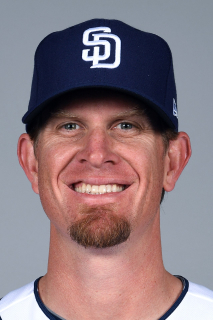 June 22, 2017 San Diego Padres sent RHP Jered Weaver on a rehab assignment to El Paso Chihuahuas. May 20, 2017 San Diego Padres placed RHP Jered Weaver on the 10-day disabled list. Left hip inflamation. February 19, 2017 San Diego Padres signed free agent RHP Jered Weaver. November 3, 2016 RHP Jered Weaver elected free agency. August 9, 2015 Los Angeles Angels activated RHP Jered Weaver from the 15-day disabled list. July 30, 2015 Los Angeles Angels sent RHP Jered Weaver on a rehab assignment to Inland Empire 66ers. May 29, 2013 Los Angeles Angels activated RHP Jered Weaver from the 15-day disabled list. April 9, 2013 Los Angeles Angels placed RHP Jered Weaver on the 15-day disabled list retroactive to April 8, 2013. Nondisplaced fracture in his left elbow. June 20, 2012 Los Angeles Angels activated RHP Jered Weaver from the 15-day disabled list. August 13, 2011 Los Angeles Angels activated RHP Jered Weaver. August 6, 2011 RHP Jered Weaver suspended. June 30, 2006 Los Angeles Angels activated RHP Jered Weaver. June 16, 2006 Los Angeles Angels reassigned RHP Jered Weaver to the minor leagues.